The very words “Il était une fois” conjure up a sphere of supernatural allure and intervention. The Metropolitan Opera has neglected Cendrillon far too long. An exquisite, sumptuous score and a highly efficient libretto make this work, in my opinion, superior to Massenet’s other operas. That being said, the arrival of Laurent Pelly’s competent production at the Met (by way of Santa Fe and Covent Garden) is reason enough to celebrate—if not, perhaps, for the merits of its design and direction, then for its ability to highlight this long overlooked work. Based on the classic Cinderella fairy tale by Charles Perrault, Cendrillon delves into the primordial yearnings and fantasies latent within the source material. And it probes the narrative’s psychological depths, tapping into archetypical fears and desires, while not taking itself too seriously. Why, only now, the work is having its premiere at the house is a puzzling question. It is a perfect fit for the Met, especially in its suitability for outreach. The plot is universally known and fairly uncomplicated; and the score, with its playful, magical passages and sweet lyricism, are an easy swallow for audiences engaging with operatic material for the first time. In other words, Cendrilloncould easily be a gateway drug for opera neophytes, building an audience the Met desperately needs. Fortunately, the opera’s charms were clear during the company’s premiere of the work. Conducted with precision and athletic finesse by Bertrand de Billy, the orchestra and cast leapt through the score with easy exuberance. And Pelly’s production, while stinting on glamour and magic, managed to avoid trashy gimmicks and self-serious pretension. The most commendable quality of Pelly’s production is its investment in the narrative. Pelly’s sets have inscribed upon them the French text of the fairy tale. Beginning with the generic Il était une fois, the story’s words are a fundamental building block for the world Pelly has created. This central idea exemplifies the ways that fairy tales, especially ones as ancient and ubiquitous as the Cinderella narrative, have a way of forming one’s worldview—with constricting social and economic limits, and the belief in magic to transcend them. Pelly’s conceptual approach is admirable; it’s tasteful and sincere. But it also lacks theatrical magic, an element clearly present in Massenet’s perspective (as opposed to a composer such as Rossini). The very words Il était une fois conjure up a sphere of supernatural allure and intervention. On this front, Pelly shows a bit too much restraint. It would have been nice if the company had made its mark on the opera by amplifying the production values. As it stands, the sets and costumes seem a bit dwarfed by the size of the house. Pelly does inject vitality with his costume designs. He plays fast and loose with time period, but his sportive confections pull out the playful sides of the opera. The wicked stepmother, aptly named Madame de la Haltiére, bustles around the stage in a getup fit for a drag queen. Her two daughters, Noémie and Dorothée, are arrayed in highly structured garments, augmenting their silly, vapid personalities. And when Prince Charming witnesses a parade of ridiculously dressed damsels—all in shade of red—Pelly smartly utilizes this scene for some levity. At the premiere, the efficient production and attractive score made certain vocal deficiencies more forgivable. 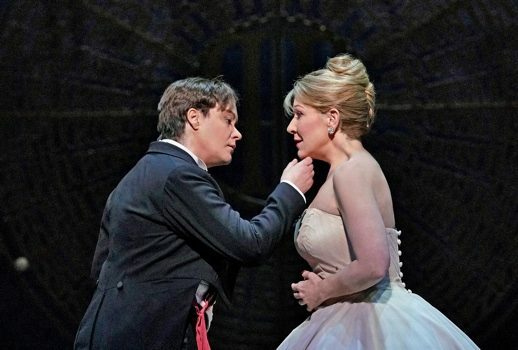 Joyce DiDonato, as Cendrillon, was disappointing. Cendrillon (also known as Lucette), is sung by both sopranos and mezzo-sopranos—Frederica von Stade, for example, successfully performed the role, while sopranos such as Joan Sutherland have recorded certain arias. The role requires bloom in the higher register. DiDonato’s top was colorless and strained—a slight flutter with unreliable intonation. To make matters worse for DiDonato, her failings were highlighted by Alice Coote’s excellent work as Prince Charming. Her rich, gathered mezzo was darkly romantic. She especially managed to make the second act aria “Allez, laissez-moi seul” plaintive and sincere. Stephanie Blythe’s Madame de la Haltiére, flanked by the wonderfully lambent Ying Fang and Maya Lahyani as the stepsisters, showed a snappy playful side, campy and grand with perfect comic timing. Her booming mezzo-soprano launched through her character’s tirades with tongue-in-cheek self-seriousness. And as her milquetoast husband Pandolfe, Laurent Naouri had depth, wit, and warmth. While his sonorous bass-baritone had some difficulty moving through the score, it was forgivable in light of his character’s function within the plot. Kathleen Kim’s vocal pyrotechnics conjured some magic as Lucette’s Fairy Godmother, providing aurally what should have been supplemented visually. Her coloratura moved well through dizzying passages, though her sound lacked a satisfying ping. However, her small frame and large magic wand gave the soprano a lot to work with theatrically. Despite DiDonato’s disappointing turn in the title role, and a production that wastes opportunities for indulgent beauty, the Met’s performance served the opera enough to make a case for its place within the company’s repertory—a sensuous and seductive score being the primary reason to revisit the work; also, it would be nice to see other artists attempt these roles. My hope is that Cendrillon returns again and again, taking its rightful place alongside Massenet’s other great works as a prime example of opera’s transcendent magic.